Cooking with garlic is one skill that every chef needs to know about, as it is found in nearly every type of dish and sauce in world cuisine. Garlic was first grown for culinary use in Central Asia, and then was traded to the Mediterranean nations, where it became a staple part of the diet. It’s now grown in just about every country worldwide. Garlic also has a lot of medicinal benefits as well as being used in cooking. Acne - Garlic has great antibiotic and blood cleansing properties, so it can be used to help clear excess oil and dirt. As a warning, garlic should always be taken orally to gain the maximum benefit. Antioxidants - Garlic naturally contains a protein called allicin which naturally increases antioxidants in your blood. Antioxidants help to purify your liver from alcohol and break down hard fat cells. Blood pressure – Incredibly, cooking with garlic has been clinically proved to reduce the blood pressure of patients by up to 5%. This is due to its similar properties to aspirin which is often used as a blood thinner. This can help reduce the chances of strokes and heart attacks dramatically. Pre-crushed – pre-crushed garlic comes in jars that you can spoon out and add to any dish in a matter of seconds. However, you leave yourself with out the option of fine garlic slices or roasted cloves. 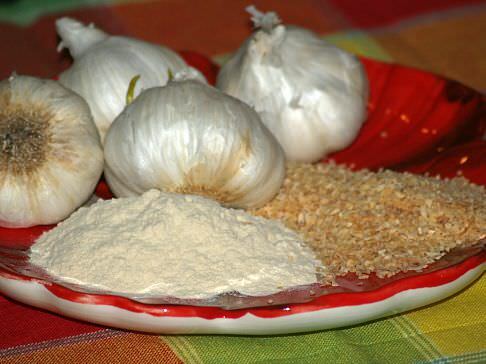 Powder – garlic powder is made from cloves that have been dried out and ground up. Only use this option if the recipe calls for it, as you won’t get as much flavor from this option. Some olive oil. The more you can spend on olive oil, the better taste it will have. Chop the stems off the mushrooms and clean the outside. You can scoop out the black insides to create more room, but these do add a certain amount of texture. In a sauce pan, mix the garlic, cheese and breadcrumbs till the cheese melts and you end up with a thick paste. Because it’s such a simple plant, cooking with garlic is often this easy. Spread the paste into the mushrooms and make it even. Try not to over stuff the mushrooms, as the garlic mixture will leak over the edge and ruin the look. Drizzle the olive oil over the top and grill until golden brown. Serve with a simple side salad. Cooking with garlic allows you to try this delicious creamy gratin soup. Place bread on baking sheet and sprinkle with cheese; bake until cheese melts (A few minutes) and set aside. Melt butter in Dutch oven; sauté onion and garlic until tender. Stir in flour; cook and stir until golden brown. Add beef broth: cover and simmer for 20 minutes. Puree mixture in food processor; return to Dutch oven. Season soup with salt, pepper, nutmeg and lemon juice; add cream and reheat (Do not boil). Ladle soup into bowls and top with a slice of toast; garnish with oregano. Cooking with garlic creates this versatile mayonnaise; use as regular mayonnaise. Squeeze pulp into blender from roasted garlic bulb; add ¼ cup oil, egg substitute, mustard and vinegar. Process stopping to scrape down sides; add remaining oil as you process on high speed. Whether you are cooking with garlic for the flavor or the health benefits, you may eventually find that you are adding a bit of garlic to just about every dish you cook.